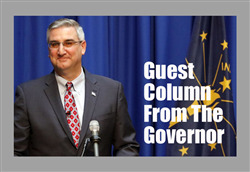 Editor's note: The following guest column was submitted by Indiana Gov. 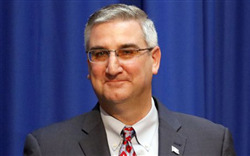 Eric Holcomb. A sales tax on medical devices that has been suspended since 2016 will resume in 2018 unless Congress takes action to repeal it by the end of this year. At a time when technical advancement in the life sciences is at an all-time high, this medical device sales tax threatens to stifle medical advancements, stop new investment and prevent future job growth. Furthermore, the Obamacare system the tax was designed to support is crumbling under its own weight. For all those reasons, it’s time for Congress to permanently repeal the medical device tax. Medical device companies are crucial to the continuing advancement of medicine, and the technology they produce has been life changing for families. Consider NICO Corporation, an Indianapolis-based company that developed a revolutionary technology called NICO BrainPath. The new technology creates a path the size of a dime in a person’s brain for a surgeon to operate with minimal damage or invasion. Beyond astounding medical breakthroughs, the medical device industry also supports high-wage Indiana jobs. Our state has among the highest concentration of medical device jobs in the U.S., with the life sciences industry alone employing approximately 56,000 Hoosiers. Indiana’s booming life sciences industry is home to several medical device giants, such as Zimmer Biomet, Roche, Boston Scientific and Cook Medical – along with countless smaller companies and startups. And, these medical device manufacturing jobs pay 41.7 percent more than the average wage in Indiana. The negative effects of the medical device tax between 2013 and 2016 were clear: The tax resulted in the industry losing about $82 billion in medical device sales. Moreover, the tax stopped investment in new technology that was essential for health care advancement and for growing our economy. OrthoPediatrics, a company located in Warsaw had to freeze hiring and stop research and development for new products intended to help disabled children walk again because it needed the money to pay the medical device tax. Similarly, Cook Medical in Bloomington was forced to hold off on plans for five new manufacturing facilities in the Midwest so it could use the money to pay its tax bill. The medical device tax has failed to achieve its purpose. Proponents of the tax said it would raise revenue to help pay for Obamacare and increase medical device sales. Instead, it has generated 27 percent less revenue than originally projected while reducing investment and billions in sales. We should be building a tax system that unleashes economic growth, not one that chokes it. There are many complicated issues facing leaders in Washington in the months ahead, but repealing the medical device tax is a smart and straightforward move that will encourage innovation and economic growth in our state. Congress should act now to permanently repeal the medical device excise tax.